For centuries, the Jemaa El Fna (Rendezvous of the Dead) has remained the stage for one of the most spectacular social forums on the planet. By day, this central square in the city of Marrakesh, one of Morocco's great imperial cities, fosters a kaleidoscope of entertainment for its local inhabitants; storytellers, acrobats, magicians and snake charmers all create intriguing displays of bewitching spectacle. As the sun sets, the evening grows frantic with the pulse of the crowd; it is then that the night musicians set up. Free from the restrictions and expectations of light entertainment for a tourist crowd, these musicians manifest ecstatic performances that animate the audience and players alike. The groups represented on this album; Troupe Majidi, Amal Saha, and Mustapha Mahjoub, are working and carrying the torch of their musical heroes nightly in the square. These songs come from the repertoire of Morocco's greatest musical exports: Nass El Ghiwane, Lemchaheb, Jil Jilala, Larssad and many others from the Chaabi (Moroccan popular music) canon and are given a raw, emotional and fiery interpretation. Instruments are powered by car batteries and blown out through megaphone speakers. These recordings represent a rare opportunity to hear this music at such close proximity taking in all the power and passion of the performances. The raw fidelity captures an unflinching immersion of what is simply some of the greatest street music on earth. Recorded by Hisham Mayet in 2005, a few of these performances were featured in his film Musical Brotherhoods from the Trans-Saharan Highway (Sublime Frequencies DVD SF041). 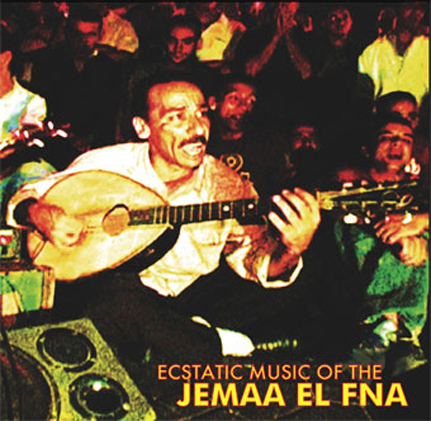 This collection also contains tracks not present in the film for a more potent snapshot of the ecstatic Jemaa El Fna. Limited edition LP comes in a beautiful full color gatefold Jacket with photos of the musicians and liner notes by Hisham Mayet.